Nana’s Chicken and Gluten Free Dumplings is a delicious version of the classic recipe with gluten free dumplings that are also dairy free. This recipe post is by Jane Scott (Lise’s mom). 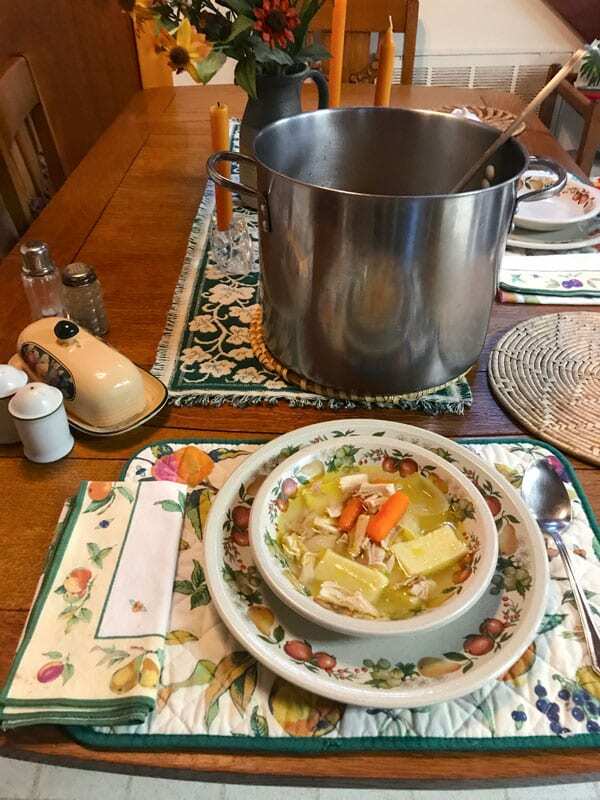 It’s interesting that when I thought of making one of my favorite childhood dishes I thought of my Grandmother Ammie McGee’s chicken and dumplings. But none of my McGee cousins that I asked had her original recipe. It was my Mama Blanche’s recipe from my dad’s side of the family that gave me an original recipe for dumplings. But I probably remember my Grandmother McGee’s dumplings best because my brother Larry and I lived with her one summer when we were six and seven. Grandmother Ammie lived in Hartford, Alabama and had a tiny kitchen with a metal Hoosier kitchen hutch where she rolled out her dumplings. She’d get my Granddaddy McGee to go out in the backyard to grab a chicken to prepare for the pot. Granddaddy would ring the chicken’s neck, pull it’s feathers out and deliver it to Ammie’s kitchen sink to wash thoroughly before being added to the cooking pot. Both Grandparents had a barn, chickens, and a garden out back of their houses. Back then in small towns everybody had a barn. We had a barn behind our house (in Ozark, Alabama) with chickens and eggs that we’d collect every morning along with a male cat named Queenie that’d keep the mice away. Grandfather Wells had a cow that he’d milk every morning before breakfast. I was too curious about that cow one day and cut my arm when I was four trying to climb the barbed wire fence to reach her. Still have a scar to remind me of that incident. I asked my Cousin Nigel Wells if he remembered the cow’s name. He didn’t recall her name but he did remember the family story about how his Dad walked the cow from Daleville to Ozark for our Grandfather. He also remembered that the cow died after eating pear peelings that were thrown over the fence by a neighbor. Here’s my version of Mama Blanche’s Dumplings made without gluten or milk. 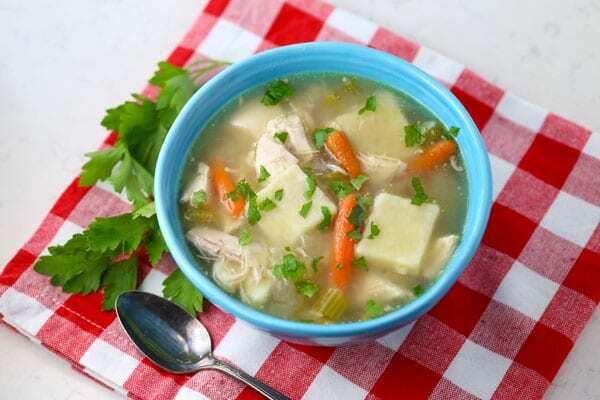 • Start by stewing a whole chicken in water with bouillon and seasonings. 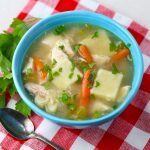 • Add carrots, onions, and celery, then stew for 15 more minutes. • Remove chicken, let cool and separate meat from the bones. • Also remove veggies from broth, set aside. 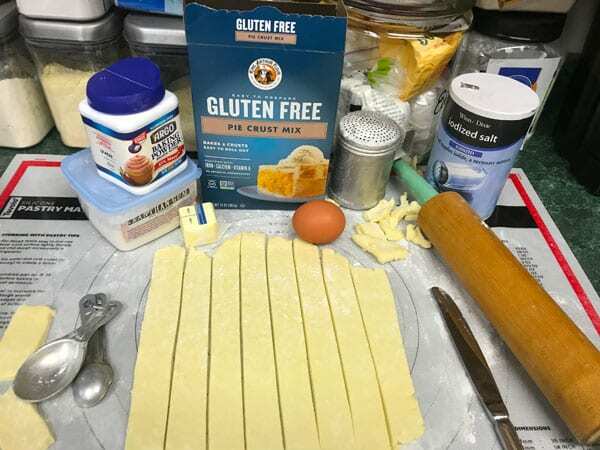 • Next, make the gluten free dumplings following the recipe below. 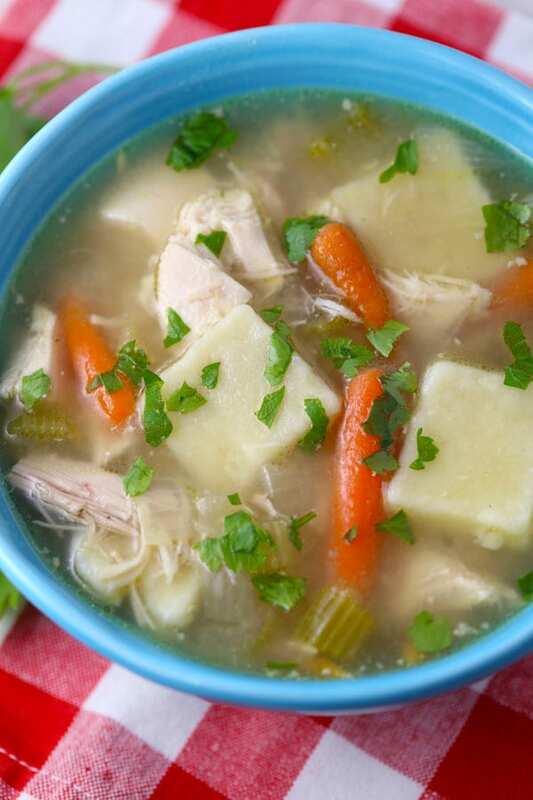 • Drop dumplings into simmering chicken broth. 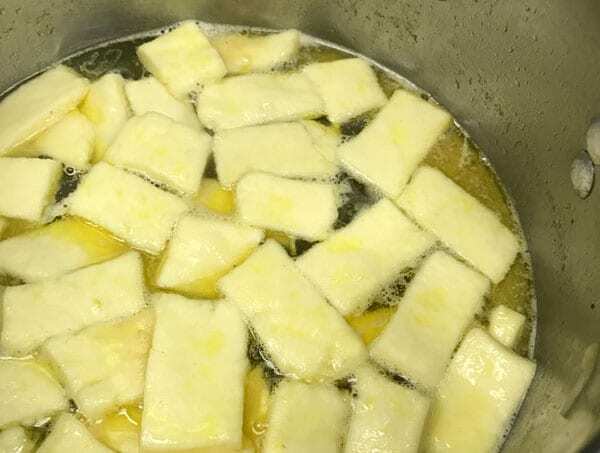 • Let cook for about 15 minutes. 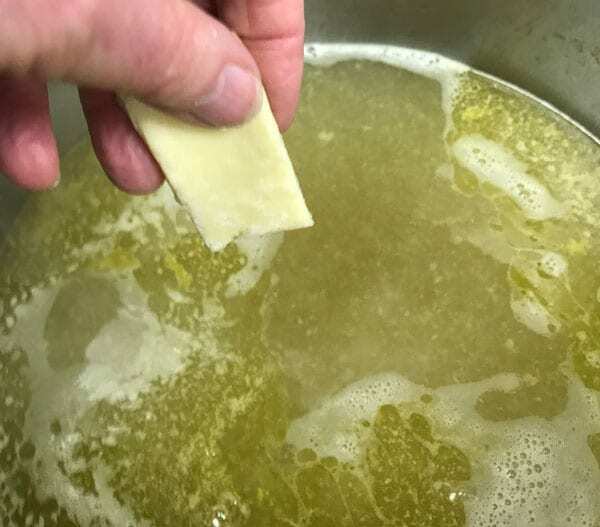 • Add the chicken and vegetables to the dumpling/broth mixture. It’s ready to serve! My daughter also made the recipe at her home. Her family loved it and she took some photos as well. Here’s her batch of Nana’s Chicken and Gluten Free Dumplings. Total comfort food without gluten or dairy! Just delicious! Nana's Chicken and Gluten Free Dumplings is a delicious version of the classic recipe with gluten free dumplings that are also dairy free. You will need one big stew pot with a lid (plus a circular rack for bottom - optional). Let whole chicken sit in pot with warm water poured on top to come to room temperature. Boil water to cover a 2-3 lb. chicken in a stew pot. (4 cups of water equal a quart. Took 4 1/2 qts. for my 3.37 lb. chicken.) I added a rack in the pot bottom that came with my pressure cooker so chicken wasn’t touching direct heat from burner. Add seasonings desired - 1 tsp. salt, 1 tsp. lemon-pepper, 1 tsp. poultry seasoning (optional). Stew for 45 minutes to an hour. In last 15 minutes add the vegetables - carrots, onion, celery. As the chicken cooks start making the dumplings. 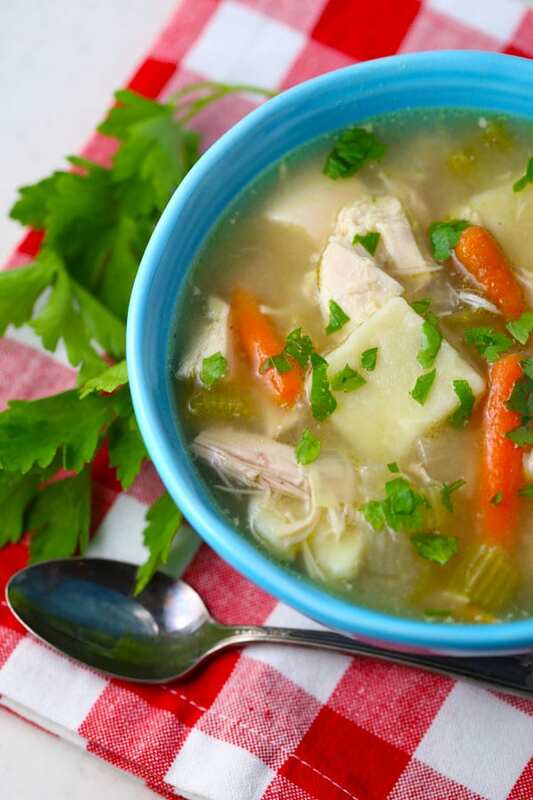 Take the chicken out of the broth to cool on a platter for 15 minutes or longer until cool enough to handle. Can remove vegetables if you like as well. 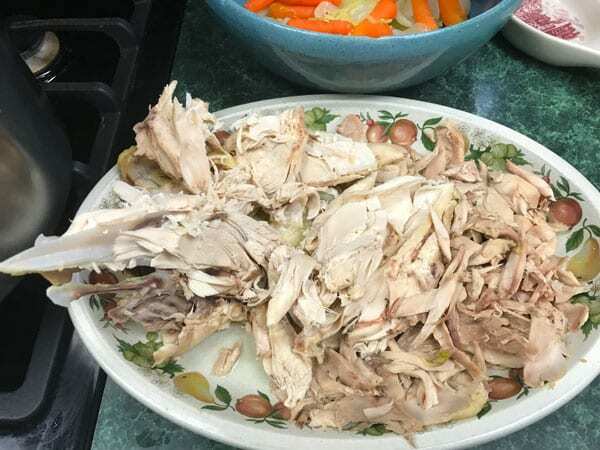 Remove bones, skin, and pull chicken apart into pieces. Drop the dumplings into lightly boiling broth. I timed the dumplings for 15 minutes of cooking time and tasted to check to see if done. 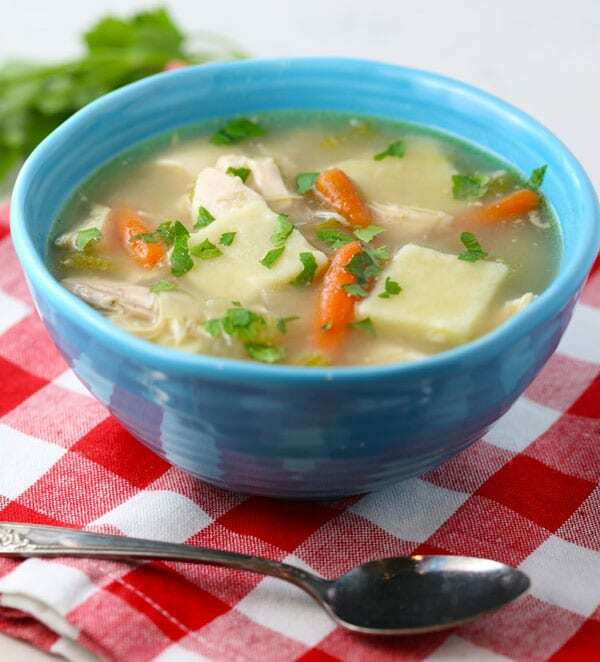 Add chicken pieces and vegetables back into the pot of chicken broth. Serve while hot. Serves six or more. Use additional flour as needed on pastry mat (Williams Sonoma). I used an extra 1/4 cup gluten free flour for this. Roll out to 1/4 inch or thicker on a floured surface and cut into strips about 1” x 2” long. Drop into lightly boiling stew broth. I took out the chicken and vegetables from my stew broth before adding the dumplings. Some recipes say not to stir but to shake pot as the dumplings will break up if stirred. These dumplings held together well. Many recipes for dumplings have them as drop dumplings but Mama Blanche rolled her’s out which is the way I made them as well. Mix as for biscuits. Knead on floured surface until right consistency to roll out. Roll into a ball and let sit. Roll out to 1/4 inch on a floured surface and cut into strips about 1” x 2” long. Drop into boiling stew. Use additional flour as needed.